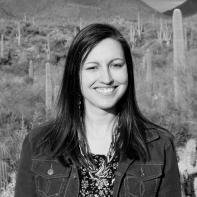 Julie Swarstad Johnson lives in Tucson, Arizona. She is the author of a poetry chapbook, Jumping the Pit (Finishing Line Press, 2015). She has been the recipient of a grant from the Arizona Commission on the Arts and has served as Artist in Residence at Gettysburg National Military Park. She works at the University of Arizona Poetry Center. On rewind, the suburbs disassemble themselves, the city’s edge receding. I know, it’s not what you think of as a city, but what else can I call this human hunger stretching out, unbroken from mountain to mountain? Rewind, and tiles stream off of roofs through air clotted with cotton tufts, thick on the sidewalks before the sidewalks are sucked away. Rewind, and watch the farmhouse at the corner blossom, boards and beams sailing by, the cottonwood raised upright and flaming green against our enormous sky. Duck as oranges, grapefruits, and lemons streak past. They settle onto fruit stands for just a moment before they zip into the trees, falling stars in reverse. If you’re brave, rewind even further, and every grove and field will melt down into the flood of irrigation water, and then the water will finally return to the ground. The desert must be there, if you go back far enough, although I admit I can’t quite see it. from water to air to earth. at a place we’ll never reach. to take my place since. so we know they’ve gone.